To promote their new double-beef All-American Cheeseburger, get it and a side of fries for just $5 on April 22-25, 2019. Buffalo Wild Wings announced the special on the Buffalo Wild Wings Promo Page and on Facebook. “Buffalo Wild Wings’ NEW ALL-AMERICAN CHEESEBURGER: fresh, juicy beef patties seared on a scorchin’ hot flat-top and smothered in gooey slices of American cheese. And, from April 22nd-25th, you can wrap your face around one of these double-stacked, beefy-cheesy-beauties with a side of crispy fries for just $5. And yeah, we still got the hot wings, too,” the chain said in their announcement. Dine-in orders only. While supplies last. Participating locations only. Valid for All-American Cheeseburger with fries for $5.00 between 4/22/2019-4/25/2019. Limit of one $5.00 promotional order per customer per visit. For more information or to subscribe see: Buffalo Wild Wings Circle. Get a Buffalo Wild Wings coupon for a Shareable or Side* right after signing up, plus get other coupons during the year. 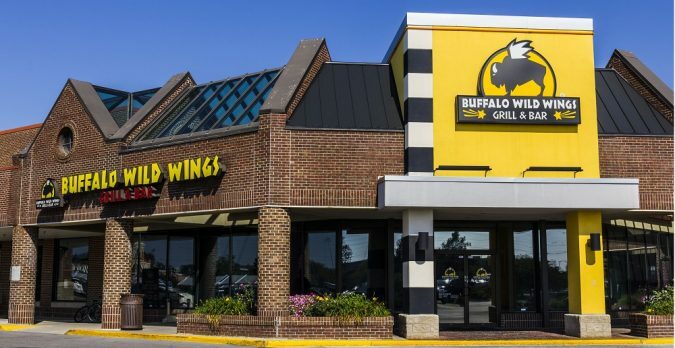 Buffalo Wild Wings Grill & Bar is a casual dining restaurant and sports bar franchise in the United States that is known for its Buffalo wings. Buffalo Wild Wings was founded in 1981. As of 2016, it had 1,195 locations (both company-owned and franchised locations) across all 50 U.S. states and DC.